Industrial disasters are not simply safety problems that need to be resolved: they also have wider significance because they offer important opportunities to learn about the "goodness of fit" between society, technology, and environment and about how that fit can be strengthened or weakened by unexpected events (Roush 1993). This is the kind of information that will be invaluable to humanity during an era of deep and far-reaching societal and environmental change. However, if we are to make optimal use of such opportunities it may be necessary to modify the way we think about industrial disasters. It is customary to view industrial disasters as "extreme events" that are different mainly in degree from more mundane disruptions to which industries and society have become adjusted. This chapter asserts that it is time to make a clear distinction between two types of industrial disasters - "routine" disasters and "surprises". As defined here, routine disasters are well understood by experts and susceptible to management using long-established principles and practices. They constitute the great majority of threats to human populations. Successful management of routine disasters mainly requires that society put into practice the ample stocks of knowledge and experience about them that already exist. Surprises, which confound both expert and lay expectations, are quite different and much less understood. They include disasters like Bhopal and Chernobyl and Minamata events or their consequences or both - that lie outside the realm of previous experience. It is advantageous to think of surprises as a coherent class of events that cuts across all types of hazards, rather than as extreme events that lie at the tails of different sets of statistical distributions.2 Since surprises appear to be increasing, it is important to develop better ways of responding to them. Because surprises are unprecedented events, it is difficult to design specific anticipatory measures of the kind that have proved successful in reducing routine hazards. Improving reactive responses to surprises may offer better opportunities for coping with surprises, at least in the short run. Communities that have been affected by surprises should learn from each other's experience and disseminate that knowledge widely. By so doing, it may be possible to identify responses that are robust and flexible across a range of different surprises and therefore worthy of encouragement and emulation in communities elsewhere. Industrial hazards are threats to people and life-support systems that arise from the mass production of goods and services.3 When these threats exceed human coping capabilities or the absorptive capacities of environmental systems they give rise to industrial disasters. Industrial hazards can occur at any stage in the production process, including extraction, processing, manufacture, transportation, storage, use, and disposal. Losses generally involve the release of damaging substances (e.g. chemicals, radioactivity, genetic materials) or damaging levels of energy from industrial facilities or equipment into surrounding environments. This usually occurs in the form of explosions, fires, spills, leaks, or wastes. Releases may occur because of factors that are internal to the industrial system (e.g. engineering flaws) or they may occur because of external factors (e.g. extremes of nature). Releases may be sudden and intensive, as in a power-plant explosion, or gradual and extensive, as in the build-up of ozone-destroying chemicals in the stratosphere or the progressive leakage of improperly disposed toxic wastes. In a narrow sense the causes of industrial hazards and disasters are malfunctions, failures, or unanticipated side-effects of technological systems. But this is a misleading oversimplification. Many other factors are involved. 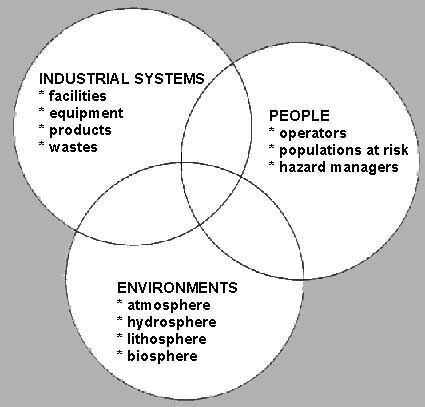 The calculus of industrial hazard is a blend of industrial systems, people, and environments (fig. 1.1). These combine in different ways to create a specific hazard. For example, faulty equipment, operator error, and a south-westerly air flow all helped to shape the events that occurred at Three Mile Island nuclear power station (Sills, Wolf, and Shelanski 1982; Houts, Cleary, and Hu 1988). The Challenger space shuttle disaster involved, among others, a vulnerable fluid seal, cold weather, and an impatient launch team - although the official inquiry blamed only the seal. Large-scale industrial disasters are one of the legacies of the Industrial Revolution; before 1800 they were few and far between. Historically, the effects of industrial disasters were typically confined to workplaces or to the transportation systems that shipped raw materials and finished goods. Accordingly, most public policies for disaster reduction emphasized safer industrial technologies and upgraded working conditions - at the mine face, on the foundry floor, in the machine shop and the power station, or on the ships and railroads that transported a majority of industrial products (Sax 1975; Chelius 1977; Rosner and Markowitz 1987; National Safety Council 1988; Whiteside 1990). Occasional extraordinary disasters affected larger populations that were not directly associated with the industrial production system. For example, in 1917 the explosion of a munitions ship in the harbour of Halifax, Nova Scotia, destroyed much of the surrounding city (Prince 1920). But it was not until comparatively recently that these latter kinds of industrial disasters became common. Since the 1970s there has been an increasing number of devastating events that produced significant "off-site" effects on the health and well-being of humans and other life-forms as well as on the nonliving environment. The partial meltdown of a nuclear reactor core at Three Mile Island, Pennsylvania, in 1979 is a good example. It is estimated that over 140,000 people evacuated an area within 15 miles of the TMI power station (Houts, Cleary, and Hu 1988). As a result of the upsurge in offsite events, the context of the industrial disaster management problem has expanded considerably. Explanations of industrial hazards and disasters have also changed. Increasingly, broad or quasi-universal explanations of industrial hazards are now emerging. Some of these focus on specific technical developments in the evolution of modern technology. Perrow highlights the growing importance of tightly coupled systems that leave little room for error and virtually guarantee failure. Accidents thus become "normal" (Perrow 1984). Lovins has made similar arguments about the inherent vulnerability of large centralized systems such as electricity transmission grids (Lovins 1981). Lagadec suggests that we increasingly live in "metastable" contexts where potential instabilities in technological systems and human systems are camouflaged or otherwise hidden from view. As a result, when perturbations occur they grow and spread quickly, undermining apparently well-designed safeguards against disaster (Lagadec 1990). Other analysts locate the problem of hazard predominantly in the human components of technology. For example, Headrick believes that industrial hazards are an inevitable consequence of dominant cultural conceptions of technology (Headrick 1990). He argues that technological innovation is typically viewed as a "linear" process that connects the achievement of a particular intended result with the use of a specific device. Little thought is given to the larger contexts that promote unintended side-effects, including hazards. Slovic and others suggest that limited human abilities to assess risks in complex systems are a crucial component in the creation of hazard (Slovic 1987). Johnson and Covello (1987) remind us that risk is a socially constructed concept. Douglas and Wildavsky contend that all societies pay attention to risks selectively and that decisions about which risks we choose to confront are highly social and value-laden (Douglas and Wildavsky 1982; Douglas, 1992). Moreover, some hazards are subject to a process of social amplification that raises their salience, often out of proportion to the objective risks (Kasperson et al. 1988; Renn et al. 1993). There is also a growing awareness that the impacts of industrial hazards often fall disproportionately on disadvantaged and relatively powerless groups. It is suggested that once such groups are empowered to defend their interests, hazards will be less likely to develop or to continue (Dembo et al. 1988). Finally, Beck contends that the citizens of economically advanced states have become part of a "risk society." This is "an epoch in which the dark sides of progress increasingly come to dominate social debate," when all of us must confront "... the possibility of artificially produced self-annihilation" (Beck 1995, 2). This period is marked by the emergence of a distinction between "risks" and "threats." Beck reserves the term risks for the hazardous phenomena of early industrial societies. These, he believes, were limited, knowable, and capable of being compensated or insured against. By contrast, contemporary threats - whether nuclear, chemical, biological, or ecological are: "(1) not limitable, either socially or temporally; (2) not accountable according to the prevailing rules of causality, guilt and liability; and (3) neither compensable nor insurable" (Beck 1995, 2). From many of these perspectives, meaningful advances in risk reduction require social change as well as the development of technical solutions. In light of the range and variety of explanations that have been advanced, it is clear that industrial hazards and disasters are highly complex phenomena subject to a multitude of contextual influences (Burton and Kates 1986). As the next section shows, they also impose heavy burdens on society. Recent studies by the American think-tank Resources for the Future and the Swiss Reinsurance Company suggest that at least 10,000 people are killed each year in major industrial accidents and that insured losses are in the vicinity of US$5 billion annually.4,5 The losses are increasing. In 1970, comparable figures were around 1,000 deaths with insured losses of US$1 billion (Marbacher 1990; Glickman, Golding, and Silverman 1992). However, these figures merely hint at the magnitude of the problem. The complete burden of industrial hazard and disaster is undoubtedly much larger. No comprehensive data on global losses have been compiled, and available figures mainly pertain to acute and intensive events. They do not report uninsured losses, or delayed losses associated with acute events, or losses due to chronic industrial pollution such as that which has affected places like Minamata, Japan. Minamata's experience with industrial disaster has been long and painful (Ellis 1989; Minamata City and Kumamoto Prefecture 1988). It is now 60 years since methyl mercury compounds were first released from an industrial plant in the city and more than 40 years since Minamata Bay became a disposal location. A few years later, the symptoms of Minamata disease were first publicly reported and it has been almost 30 years since scientists identified its causes and aetiology. The community is still living through - and coping with - the aftermath of those events. Thousands of people have been identified as victims and thousands more seek official designation. Lives have been burdened by physical disfigurements and impaired functioning or cut short by premature death. Ecosystems have been contaminated, and local food supplies have been quarantined. The community's economic base and the livelihoods of its people have been eroded. There have been deep disagreements about the allocation of blame and about appropriate restitution and countermeasures. Anxiety and mistrust have taken root in private lives and public discourse. Decision-making has been marked by protests, riots, and protracted legal disputes as well as by attempts at mediation and reconciliation. Citizen action groups have emerged to press disparate agendas, and new public institutions have been established to provide a permanent capacity for studying, managing, and memorializing the disaster. In the process, Minamata's identity has become inextricably bound up with the disease, both in the minds of its own residents and in the eyes of the outside world. Recovery continues but many uncertainties remain: the end of this disaster is not yet in sight! Unfortunately, Minamata is only one entry in a growing list of places that have been grievously affected by industrial disasters. Others include Bhopal, Chernobyl, Seveso, and Times Beach.6 Moreover, it is not just specific communities that are affected: whole regions - the coalfields of Silesia, the oilstained shores of Prince William Sound, and the acid precipitation-damaged forests of south Germany - have been stigmatized by chronic releases of industrial effluents or by sudden catastrophic accidents involving industrial products (World Resources Institute 1992). In some cases, impacts more extreme than Minamata's have been recorded. The Kyshtym district of Russia provides a particularly chilling example that involved nuclear wastes - albeit most probably from military sources rather than civilian industries. Here, an area of about 1,500 square kilometres in the southern Ural Mountains is devoid of human occupation and most signs of life. Until 1957 it was home to about 200,000 people but most of the old settlements are now empty and large signs posted along nearby roads urge travellers not to stop in the vicinity. More than 30 years after soils, lakes, streams, vegetation, and animal life were contaminated by a catastrophic release of improperly stored nuclear wastes, much of the district remains abandoned (Medvedhev 1979). What became officially known in 1989 as "The East Ural Radioactive Trace" is an example of the worst kind of industrial or environmental disaster - one that results in the annihilation of affected communities and the demise or permanent relocation of their residents (Feshbach and Friendly 1992). Fortunately, such cases are still comparatively rare, and, with the reduction in East-West tensions, those that involve military-industrial facilities may be on the decline. The potential for catastrophic disasters associated with high-level civilian nuclear wastes is a continuing problem (New York Times, 5 March 1995). None the less, though deaths, injuries, economic loss, and disruption are attributes of industrial disaster, the bulk of experience suggests that most impacted communities survive and attempt to recover their former vitality. The fact that most communities survive industrial disasters testifies to the resilience of people and the effectiveness of their responses to catastrophe. Indeed, over the long term, humans have demonstrated impressive abilities to cope with most industrial disasters, first by ameliorating their effects and then by finding effective ways to avoid, prevent, or control them by precautionary actions. Boiler explosions provide a good illustration. At one time in the early industrialization of Great Britain and the United States, boiler explosions were perhaps the most common industrial disaster (Hamilton 1973). They often led to catastrophic fires on board ships and trains as well as in factories, apartment buildings, and other places.7 Now the problem of boiler explosions is much reduced as a consequence of improvements in industrial design, construction standards, worker safety, occupational health, and other factors. Similar improvements have reduced the hazard of fires caused by faulty electrical equipment and the number of collapses of high-rise buildings. Another more recent example has come to light in the wake of hurricane Andrew, the most disastrous storm ever to have affected the United States. Despite Andrew's size, intensity, and general destructiveness on land, it destroyed or damaged very few offshore oil and gas platforms. This positive outcome continues a long-term trend of improvement in platform survivability that has come about because of advances in knowledge about marine environments, design standards, building materials and construction practices, platform siting and installation procedures, and improved operation and maintenance actions (New York Times, 21 October 1992). As these examples show, though they may be long lived (Iijima 1979; Glacken 1973), industrial hazards are neither permanent nor unchanging. The mix of hazard is always in flux. New hazards arise as a consequence of technological innovations, while existing hazards are reduced or eliminated by effective human responses. Through time, whole classes of hazard may be added to or dropped from the public agenda. Kirk Smith, a researcher at the East-West Center in Hawaii, argues that this process of change might be labelled "risk transition" and that it is comparable in importance to the socalled "demographic transition" that accompanied rapid economic development in many countries during the past century (Smith 1988). The process of developing effective responses may require many decades or longer to reach completion. The recent history of hazardous industry regulation in Britain makes this point (Pests 1988; Myers and Read 1992). After World War II, demand for the products of refineries and chemical plants increased sharply throughout the world. This led to major changes in those industries, including new production processes (e.g. bulk liquefaction of gases), larger plants, bigger inventories, and expanded throughput of products. These changes were accompanied by an upsurge in explosions and fires, particularly during the 1950s and 1960s. But it was not until the early 1970s that public policy makers in the United Kingdom began to take action in response. And it took two more decades before comprehensive programmes of hazard management were put in place. In other words, in the United Kingdom the entire sequence, from the industrial innovations that triggered the hazards to the development of effective responses, stretched across four decades. The history of coalmine disasters in the United States offers an even more salutary lesson. Numbers of mine disasters and disaster deaths rose throughout the nineteenth century to peak in the first decade of the twentieth. Thereafter they did not undergo a major decline until the 1930s. However, even as late as the 1960s, coalmine death rates were much higher in the United States than in coalmining countries of Europe (Curran 1993). Death rates were affected by changes in a wide range of factors including, among others, coal supplies and demand, mine size, levels of mechanization, coalfield labour demographics, unionization, worker education and training, laws and regulations, and mine safety programmes. Some of these changes worked toward reducing mine disasters and deaths, while others worked against that outcome. Of course, the response process might be induced to unfold faster. For example, in developing countries it is theoretically possible to adopt production systems and related hazard controls at the same time by taking advantage of experience already acquired in developed countries. But, more typically, transfers of technology to developing countries often fail to modify the borrowed systems to take account of socio-cultural circumstances in the receiving country. As a result, the potential for further disasters grows. What has just been described might be labelled a social learning model of industrial hazard management. It assumes that few hazards are insurmountable in the long run. What is required is a period of time to gain experience of the hazard, scientific expertise to investigate it, and a public commitment to put the findings into practice. Often, the process begins with reactive strategies that are intended to reduce the impacts of disasters and works toward creating anticipatory strategies that are intended to avoid the build-up of hazard. Gradually, a new hazard becomes familiar - by dint of repeated experience - and hazards managers are able to acquire a fund of knowledge about the utility of alternative coping mechanisms. In time, the match between hazard and response becomes closer and losses begin to decline. At this stage, what had once been a challenging new hazard would no longer constitute much of a threat. Certainly, social learning of the type just noted plausibly explains the changing salience of boiler disasters, offshore platform failures and many other phenomena (Sheehan and Wedeen 1993). But such learning requires that hazards and disasters occur with sufficient frequency to provide a base of experience and opportunities for testing alternative responses. How, then, can we learn to cope with unprecedented events, sometimes of vast proportions? And what if these events signal that society is already pressing against the limits of the global environment's capacity to absorb them? The next section takes up this theme. So-called "man-made catastrophes" occur with considerable frequency throughout the world every year (fig. 1.2). In 1990 the Swiss Reinsurance Company recorded 191. These included 126 transportation accidents, 35 large explosions and fires, 8 mine disasters, 6 building collapses and 16 miscellaneous others (Marbacher 1991). About 25 of these disasters took place in exclusively industrial facilities, mainly chemical plants and power stations. The three most costly were petrochemicals explosions in Thailand (54 deaths), India (30 deaths; $28 million damage) and the United States (17 deaths; $220 million damage). What is striking about the Swiss data is the unexceptional and repetitive nature of the events that they record. Dozens of the entries refer to aircraft and ships that went down during bad weather. Scores more are about buses, cars, and trains that collided or ran out of control. There are multiple cases of gas explosions in mines and factory fires. Although there might be only one such event in any country in a given year, these are hardly unprecedented disasters: they occur relatively often somewhere throughout the globe; their causes and characteristics are well known to engineers and safety managers; and they can be reduced by applying more or less reliable countermeasures. In short, they are "routine disasters". And because they dominate the global catalogue of losses, most of the global effort to reduce industrial hazards is, understandably, directed at them.8 Moreover, that effort may be paying off. According to Resources for the Future, the global total of industrial accidents, which peaked in the late 1970s, is now decreasing9 (fig. 1.2). Additional data for the United States indicate that this downward trend has taken place while levels of production have been rising (fig. 1.3). In other words, despite a growing potential for technological disasters (including industrial accidents), fewer of them seem to be occurring. But sprinkled here and there throughout the record is another kind of event, one that brings to light new and troubling dimensions of disaster. These can be labelled "surprises" (Kates 1985). Surprises are events that confound our expectations (Holling 1986). In the context of this subject they are also events that announce unprecedented hazards. In the lists of major disasters there may be only a few surprises each year but they are among the most important events. Progress in understanding - let alone managing - surprises is slow and limited. Surprises arise from two interacting sources: (1) the events that we experience; and (2) the metaphors and concepts that we use to understand those events. In other words, surprises not only have unexpected practical consequences but also challenge us to devise new interpretive paradigms. Thus, surprises raise fundamental issues about the nature and roles of uncertainty and indeterminacy in human thought (Wynne 1992; O'Riordan and Rayner 1991; Ravetz and Funtowicz 1990; Funtowicz and Ravetz 1990, 1995). It is important to realize that the underlying thrust of this chapter is not about simply reclassifying events as surprises and routine hazards: it is about asking us to change the way we think about hazardous events and eventually to change the ways we seek to manage them. For readers who are familiar with frequency/severity graphs of hazardous industrial phenomena, such as those that occur in quantitative risk analyses (e.g. Lowrance 1976; Lave 1982), a word of explanation is in order. Such graphs typically show a large number of high-probability/low-consequence events and a small number of low-probability/high-consequence events. Society is usually well adjusted to coping with the high-probability (common) events but less well equipped to deal with the low-probability (rare) ones. These graphs are useful devices for illustrating risk distributions and for suggesting alternative levels of risk that might be designated for purposes of regulation. Indeed, together with methods of comparative risk assessment, decision-making under uncertainty, and risk-cost-benefit analysis, they may be sufficient tools for analysing what are here called routine hazards. However, the term "surprise" connotes more than simply low probability. For example, rare events differ in kind as well as in magnitude, and some risks are subjectively assessed with greater dread than others that have a statistically similar chance of occurrence (Slovic 1987). In other words, surprise is a function of the unprecedentedness of an event. Moreover, surprise involves different types of unprecedentedness. Among others, these include events that were never envisaged, those that were envisaged but regarded as highly unlikely, those that were thought likely to occur but had not happened previously, and those that were thought likely to occur but (mistakenly) believed to have only minor consequences. These are representative of surprise types but they do not constitute an exhaustive list. Many of the most spectacular industrial disasters of the post-World War II era can be described as surprises: these include Minamata, Three Mile Island, Love Canal, Seveso, Bhopal, Chernobyl, the Mississauga train derailment in Ontario, Challenger, so-called "forest death" in Europe,10 Exxon Valdez, the Kuwait oil fires, stratospheric ozone depletion, acid precipitation, and greenhouse gas build-up in the atmosphere. This is a heterogeneous group. It contains some events that affected fixed facilities (e.g. Three Mile Island) and others that involved moving vehicles (e.g. Mississauga). Extensive processes (e.g. acid precipitation) are included as well as intensive events (e.g. Seveso). There are examples of mechanical systems, chemicals, and radiation. Acute events and chronic ones are both represented. Indeed, about the only characteristics that the group seem to share are hazardousness and surprise. Surprises can be classified in terms of the degree to which they connect with or depart from expectations. For example, it is possible to divide them into three general groups: (1) unique events; (2) precursor events; and (3) superlative events. Some surprises are unprecedented because they are one of a kind. For example, Kyshtym appears to be the only significant example of a nuclear waste storage disaster; perhaps there will never be another like it. Other surprises are unprecedented because they are the first of a kind, each the precursor of what later turns out to be a sequence of related events. The destruction in flight of the world's first commercial jet airliner - the British Comet - is an example: a series of apparently mysterious Comet crashes occurred at intervals until a lengthy investigation disclosed that metal fatigue was an unexpectedly serious problem in these aircraft. The sinking of the Torrey Canyon off the United Kingdom in the early 1970s was the first in a series of supertanker oil spills that brought increasingly greater damage to maritime ecosystems (Cowan 1968). Within a few years, much larger cargoes of oil were fetching up on vulnerable shores. A third type of surprise gains notoriety from being a worst of a kind event. Chernobyl stands as the worst in a series of nuclear power station accidents that includes earlier events like the Windscale incident (1957) and the accident at Three Mile Island (1979). Although it is currently the worst event of its kind, there is potential for others. A recent US General Accounting Office report indicates that 40 old Soviet-designed nuclear reactors without basic safety features are still operating in Russia and Eastern Europe (United States General Accounting Office 1991);10 of these are of special concern (New York Times, 23 July 1995). It is also possible to classify surprises in terms of the degree to which they are susceptible to prediction and control. Here, three groups of hazards stand out: (1) unsuspected hazards; (2) improperly managed hazards; and (3) instrumental hazards. Unsuspected hazards involve substances or activities that were regarded as harmless or benign until scientific evidence or human experience showed otherwise. DDT, asbestos, and chemical chlorofluorocarbons are representative examples. Improperly managed hazards involve failures of various kinds of hazard control systems. Most major industrial accidents are of this type. Well-known management failures have taken place at nuclear facilities (e.g. Windscale, Three Mile Island, Chernobyl), chemical plants (e.g. Seveso, Basle, Bhopal), and transportation systems (e.g. Challenger, Exxon Valdez), as well as in storage and disposal sites for toxic materials (e.g. Kyshtym, Times Beach, Love Canal, Minamata). Instrumental hazards are intended to cause harm and are consciously employed towards that end. They include sabotage, arson, and warfare (Matousek 1991). Military industrial technologies belong to this group (e.g. nuclear, biological, and chemical weapons such as defoliants and nerve agents; deliberate oil spills and oilfield conflagrations). The mismanaged wastes of military industrial technology are also an important form of improperly managed hazards. Although instrumental hazards lie entirely within the domain of human control they have never been easy to prevent, control, or reduce. Certain military industrial technologies have been subject to controls (e.g. nuclear test ban treaty, SALT treaty) but many others are not controlled. There are strong pressures to continue to develop, test, and maintain most innovative weapons systems. Improperly managed hazards are outcomes of failed controls. They pose problems that might be ultimately solvable, but we have yet to find and adopt appropriate solutions. Unsuspected hazards are effectively unknown, at least until disaster strikes or is imminent. They lie at the outer limits of our awareness but, once identified, may be susceptible to control. Some of the more complex surprises are blends of industrial hazard and natural hazard (Showalter and Myers 1994). For example, river floods provided the means by which a hazardous chemical - dioxin was spread through the community of Times Beach, Missouri, leading to its eventual abandonment. Experts worry that rising sea levels may soon allow sea water to leach nuclear wastes that are buried on Pacific atolls, thereby bringing about serious - perhaps unprecedented - results (Walters 1992). A further characteristic of recent industrial surprises deserves comment. Unlike previous industrial hazards, whose effects were mostly confined to people in close contact with the industries, many of the new surprises have demonstrated the potential to inflict delayed catastrophic losses on people and life-support systems often far removed from the industries themselves. Some of them can reach across space and time to affect vast numbers. The spread of radiation associated with the Chernobyl nuclear power station fire (1986) is an appropriate example. Although communities in the (then) USSR and Eastern Europe received most of the contamination, smaller levels of fallout circulated as far afield as the Alps, the British Isles, and Scandinavia (Smith and Clark 1989). Today an area of at least 13,000 square kilometres is officially classified as being heavily affected by radiation, but some of the worst contamination is known to lie outside this designated zone. Apart from those who died at the time of the accident, a minimum of one million people mainly in Belarus and the Ukraine - live with the possibility of impaired health and truncated lives. They include an unknown number of former employees of the Chernobyl power station; an additional 600,000 people who took part in extinguishing the fire, building the concrete "sarcophagus" that entombs the stricken reactor, and decontaminating the vicinity; 135,000 evacuees from the so-called "exclusion zone" that was established after the fire; and 272,000 inhabitants of the surrounding "zone of strict control." The lives of others who live further afield have also been affected, by such measures as restrictions on food supplies that were exposed to fallout and changes in national energy policies that de-emphasized the use of nuclear power (Bojcun 1991; Brenton 1994). The effects may be felt for generations (Park 1989; Marples 1988). Finally, some surprises raise the worrisome possibility that industrial hazards have evolved to the point where they are now capable of fundamentally altering global biogeochemical systems. Concern about humaninduced climate change is a leading example (Mintzer 1992). Atmospheric build-up of chlorofluorocarbons is directly attributable to industrial processes. Increases in atmospheric carbon dioxide are also a function of industrial activities (especially power generation and vehicle use) as well as a function of the intensification of nonindustrial activities (e.g. forest clearance for agriculture). It is widely believed that global warming might well affect the frequency and magnitude of conventional natural hazards, such as tropical cyclones and drought (Mitchell and Ericksen 1992). This example illustrates an important characteristic of evolving surprises - they are beginning to dissolve long-standing conceptual boundaries between what were thought of as natural hazards and what were considered industrial or human-made hazards. In the realm of global change surprises that are driven by industrial hazards, both the outcomes and the relative contributions of people and nature are in doubt. But there is unanimity that the issues are vitally important to the entire planet. Surprises pose conceptual difficulties for hazard researchers and hazard managers. On the one hand, surprises can be viewed as extreme events or anomalies - outliers in the distribution of events to which they are most closely related. Thus, a toxic surprise like the dioxin cloud at Seveso is seen as a special case among all airborne toxic releases. Or the Chernobyl explosion and fire is seen as a more extreme kind of nuclear power station accident - an extension of events like Three Mile Island or Windscale. From this perspective, improved responses are likely to be found among measures that have proved to be effective against the most closely related class of events. On the other hand surprises are - to a greater or lesser degree - unlike other events. They are often indicators of abrupt or discontinuous change and may be forerunners of new sets of events (Brooks 1986). Existing responses are almost certainly mismatched with these new hazards and may be entirely inadequate. It is often necessary to learn about surprises and respond to them simultaneously. The process can stretch over many decades, with many frustrations and continuing losses along the way. Promising management approaches turn out to be blind alleys because they are based on flawed expectations about causes, behaviours, or actions that grew out of experience with other types of hazards. The contradictions are illustrated by a recent example. After the Chernobyl explosion, British and Nordic scientists confidently expected that upland pastures that received moderate doses of fallout would not pose serious threats to livestock. They were forced to revise this judgement and institute restrictions on sheep farming when high levels of radioactivity showed up in animals that grazed these areas. Eventually, months after the event, it became clear that prevailing knowledge about the uptake and conversion of radioactivity in soils had been based on experience with alkaline soils; upland soils in Britain, Scandinavia, and elsewhere are highly acidic and respond quite differently (Wynne 1992). As this example shows, there are dangers to managing surprises using principles that are applicable to routine hazards. Indeed, the very nature of surprises - many types but few cases of each, unusual amalgams of phenomena that we are accustomed to treat separately, increasingly potent and far-reaching in space and time, confounding of accepted wisdom - tends to frustrate conventional management. How can an appropriate alternative management system for surprises be fashioned? It is too early to give an answer to that question for we are only now beginning to think systematically about surprise as a special kind of management problem. However, a first step towards the answer is to treat surprises as a heterogeneous but coherent class of events that shares the common characteristic of challenging our expectations. That is not to say that all surprises are the same; quite evidently they are not. Table 1.1 is one attempt to characterize some of the salient differences and similarities among surprises. It arranges a sample of surprises in a matrix whose axes roughly correspond to variables of control and experience. As portrayed here, prospects for control increase as we move from left to right and levels of experience increase as we move from top to bottom. This table provides a kind of conceptual "map" of surprise. Ideally, the boxes in the matrix might be filled with many more examples - say, all surprises that inflict more than some minimum amount of loss. This would permit identification of subcategories of surprise that currently impose the heaviest burdens on society. A time series of such assessments would provide useful information about the shifting nature of surprise and the rate at which some surprises undergo the transition to routine hazards. a. Control increases from left to right; experience increases from top to bottom. The purpose of classifying surprises in this - or a similar - manner is to help structure investigations of responses and thereby to lay the basis for a surprise-management system. For example, warning systems, emergency-management schemes and recovery programmes are three of the many responses to hazard. It would be valuable to examine the record of success in employing these responses across the full range of surprises. It may be that certain actions are particularly flexible as well as effective and that others are restricted to one niche in the matrix. At this stage it is not possible to do more than indicate these general directions that investigations might take. It should be realized that a system for managing surprise would supplement, not replace, existing systems of hazard management. Existing systems would continue to be applied to routine hazards, which constitute the bulk of all hazards that confront society. Indeed, a successful system for managing surprises would be one that facilitates the transition of surprises to routine hazards.